With 4 months to go before the launch of The Well, preparations are well underway (no pun intended!). I’ve blogged quite a bit regarding the nature of this ministry initiative, but I have said very little about the shape of the physical environment. While the character of the ministry is paramount, my reality for the next two months will be the ‘nuts & bolts’ of the physical space being utilized for The Well. First up is painting our Sports Hall. The existing look is partly ‘tired’ and partly an awkward mix of yellow and green (see pic below). As you can see, we also have some drywall work to be done behind the basketball net. This is a big job, made easier through the donation of time and equipment from my good friend, Jim Allan, who is an elder at Fraser Presbyterian Church (my former congregation). Additionally, we’ll be painting the entrance to the Sports Hall, which also has a tired, blue-gray appearance (see pic below). Not sure if these walls have seen a coat of paint in a few decades. Don’t worry, the wood is being left untouched–it is beautiful, and we hope to excentuate that with the sandstone (light beige) colour paint on the walls. 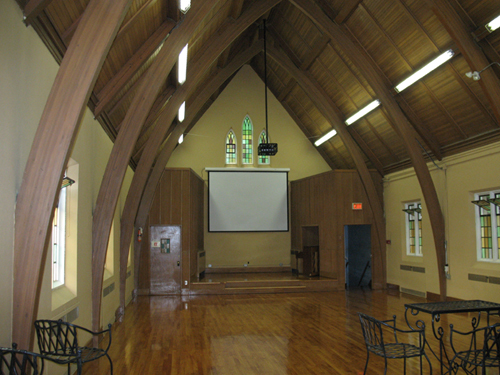 Once the painting is done, we need some extensive electrical work done to handle the increased power draw from things like a/v equipment, guitars, coffee makers and additional lighting. I’ve been searching far and wide for comfortable, stackable, and affordable chairs. By the way, I had no idea chairs could be so expensive! The model that best fits the criteria can be viewed here. We need between 120 and 150 chairs, so the total cost will be substantial. I’m also on the lookout for ‘coffee house’ type furniture for our ‘Coffee Corner’. Again, comfortable and affordable are key. If you have any suggestions, please email me…otherwise the search begins at Ikea. Next up is the video equipment: giant retractable screen and projector. I’ve got a few leads here I’m currently following. Speaking of audio/video, this is the one area where we still have a personnel void. We’ve got a handful of volunteers signed up to help, but we still need a ‘point person’, who is competent to set up our Sunday line-up of announcements, music lyrics, and video footage. Please pray for our search. We’ve had three Team Leader meetings so far, and I’m hugely encouraged by the energy, commitment, and faith of our volunteers. I’m hoping, expecting, and praying that progress will be fast and furious over the next couple of months, so check back here to track the transformation. Are you able to help us in some way? Let’s be in touch. I’d be grateful for your support on any, and every, level. This entry was posted in Ministry Update by Bryn. Bookmark the permalink. Hey Bryn…I’m listening to Kristian Stanfill (one of the music discoveries I made at Orange), and he has a song called “Spring of Life” which features the lyrics, ‘Jesus You’re the well that won’t run dry.’ I thought of you and The Well as soon as I heard it. I thought I’d pass it along in case you could/wanted to use it as some ‘theme music’ around the launching. It’s so exciting to watch this process taking place! Thanks for that tip…wow, what a find…I’m listening to Kristian Stanfill as I type this. That’s exactly the sound I’m looking for. Love his rendition of ‘Jesus Paid It All’. I’m so excited to read about the transformation that is taking place! What a great name – The Well – it evokes such wonderful imagery of renewal and ‘quenching’ our faith (is that grammatically possible!). Regarding your quest for furniture – we have been searching for cool 50s retro restaurant furniture for our youth room and found a great source using http://www.kijiji.ca. It turns out that there’s a supplier of NEW retro-look furniture (the cool chrome tables and vinyl with glitter-fleck chairs) in Shanty Bay, not too far from us in Baxter. Maybe there’s a source for coffee shop furniture there as well! I will be keeping you and your congregation lifted high in prayer, as I know that transformations such as this don’t come without some pain, but our God is such an awesome God and He is keeping you close to His heart. Thank-you for those kind and encouraging words Heather! Thanks also for the tip re: furniture search. 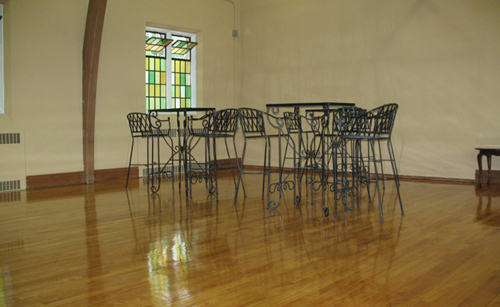 I look forward to the day when I can post pics of the painted & furnished worship space of The Well!